After going to Southern Thailand twice (and having failed to blog about it), I was so excited to see a different side of Thailand...the North! Despite there not being a giant ice wall dividing the north from the south, the two sides could not feel more different. While Southern Thailand has some of the world's most beautiful beaches, the hoards of tourists everywhere is a big drawback and prices tend to reflect the region's increasing popularity. On the other hand, Chiang Mai felt slower, friendlier and certainly more authentic. Although it's a popular backpacker destination, I never felt overwhelmed by tourists. It's more of a place to explore the surrounding nature, unwind with a cold cheap beer, and dig into some of the best Thai food I've ever had. Seriously, the food is amaze-balls. One of the first things we did was go over to Wua Lai Road for the lively street market. It's always a huge dilemma going to places like this because everything looks amazing but has a slight degree of uncertainty. We tried a surprisingly fresh sausage and vermicelli "salad" and these delicious little bundles of coconut pudding with sweet corn. A perfect snack before going temple hopping in the old city. It's easy to get temple-fatigue in Asia, but it's also easy to forget how impressive it is that there are so many beautiful old temples in even the smallest towns. The old walled city of Chiang Mai is a good spot for visiting several temples and biggest of them is Wat Chedi Luang. Although in ruins, it still remains an active place of worship for brightly robed monks. 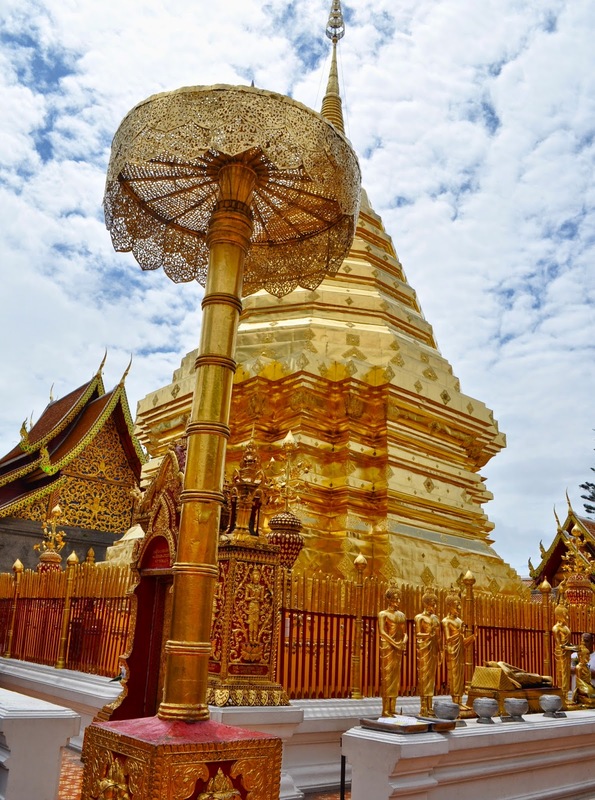 For a bigger temple, we ventured outside Chiang Mai to Wat Phra That Doi Suthep, which is located on top of the mountain Doi Suthep. The fresh air and view alone up there is probably worth the visit. It's hard to get up the winding roads by tuk tuk so we took a red songthaew up. There are set locations around old town walls where it's possible to get a songthaew, but otherwise they are constantly driving around and know exactly where you're going. Once there, it's just a short climb up a set of steps to the beautiful golden temple. For an afternoon lunch we stopped at one of the town's many random street stalls (aka. an old woman cooking), for some fried noodles and noodle soup. Both plates had the exact same ingredients, just cooked slightly different, and they were delicious and cheap. For one of the nights we went a little further out town to Paak Dang for dinner, located on the riverfront. During the off-season the restaurant was empty but there was still a live guitarist playing. Their papaya salad was amazing because of the shredded crispy catfish on top. Who knew catfish could be look like floss? It propelled papaya salad into a whole new level. We had some other dishes we have never tried before, such as the pork curry and the mixed seafood steamed in a whole coconut. The service, music and food were all excellent. Another night we tried Lemongrass, a small restaurant located just further down the street from all the sketchy massage parlors (we'll get to that later). Looking at the walls of Lemongrass, it's clear this place was popular. Hoping for a whole fish but unable to find any, we settled on a sweet and sour crispy fish fillet that was topped with these flash fried mystery greens. We also tried yellow curry for the first time, which is a milder alternative to other Thai curries. Lastly, the beef with cashews was a familiar combination of Thai and Chinese. Everything was so good, contained richer flavors and tasted infinitely fresher than anything I've had in other parts of Thailand. Chiang Mai is an excellent jumping ground for many outdoor adventures, and being surrounded by mountains there are beautiful hikes all around. We decided to spend a half a day going zip-lining which was a fantastic thrill. Instead of the famous Flight of the Gibbon, we went with the Eagletrack which offers just as many lines at a much lower price. The views are not bad either. The entire route can be done in about two hours and they even provide a hot lunch at the end. Despite my love for cooking, I've never actually taken a cooking class, but I thought if there was anywhere to do it it should be in Thailand. There are numerous cooking schools in Chiang Mai town and we went with Asia Scenic Cooking School recommended by a friend, located in the middle of the old city. The half day course included a small market tour and 3 dishes from scratch. Yes they advertise 4, but since one of them is the curry paste, it really shouldn't count...even though the curry paste is the hardest. The dishes were not very complicated so it's good for any beginner, and there ends up being a decent amount of food. Everyone gets their own station with wok so it's very hands on. Of course, one cannot go to Thailand without getting a cheap massage. I've learned when visiting massage parlors, it is not a good sign if 1)one woman looks like she has herpes, and 2)another woman stumbles out of a room without pants. These were two signs to leave immediately and maybe to fork out the extra $1 each for a decent STD-free massage. This makes me wanna travel to Thailand!